Back orders and discontinued items are a normal part of life. With Kinetic Inventory Management, you can easily manage back-orders and partial shipments as they arrive at your warehouse. By following the steps below, you can handle partial shipments just as easily as completely filled orders. We'll use a newly created purchase order to show how this process works. After reviewing and adjusting the quantities on the Receive Purchase Orders page, you can type in the actual quantity of an item received in the 'Received' text box. If an item is either partially received or maybe even not received at all on the current shipment, but is expected to arrive later, you can enter either a zero or the quantity you actually received. See the example screen shot below for a shipment where only 6 of 10 Giant Fly Swatters were received as well as 3 of 6 Jet-Powered Roller Skates. Also, our supplier has notified us that the Cactus Costume has been discontinued and will not be arriving later. In this case, all you need to do is enter a lowercase letter 'x' to designate an item as canceled from the purchase order. After you have made all of your adjustments on the 'Receive PO' page, you can just go ahead and click on the 'Receive' button to check in all of the items you have received to date. 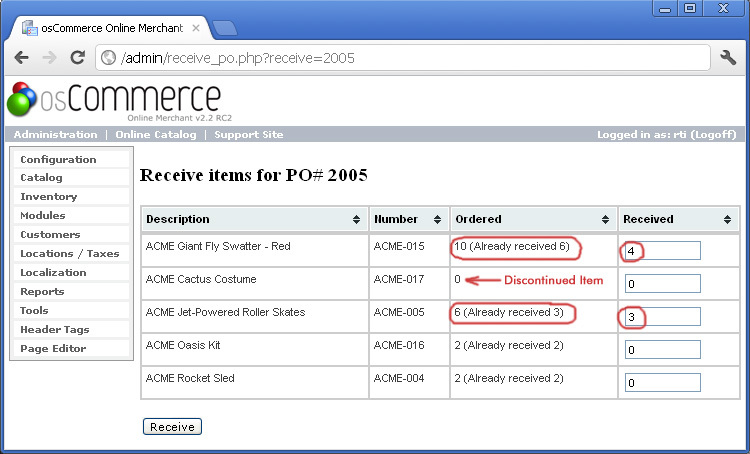 The 'List PO's' page then automatically color codes this partially-received order with a yellow background to designate it as an incomplete order. 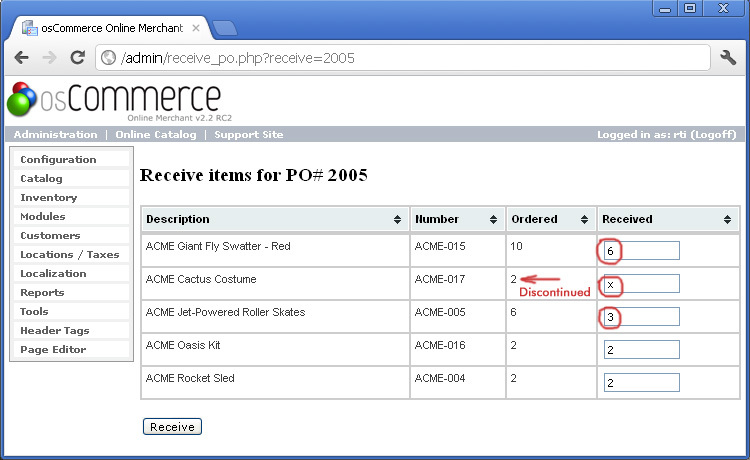 Here is the final screen shot showing how you can "close" Purchase Order #2005 once all the items on the order have been completely received. We have already cleared the one discontinued item from the order by entering an 'x' in the previous step, so the KIM program is no longer expecting this item to arrive. The remaining items show a number followed by another number in parentheses showing how many items you have already received. In our example below, let's say you received all of the items to complete your order as shown below with the newly-received items circled in red. Now, when you click on the 'Receive' button, all of the outstanding items are automatically added to your inventory and the yellow background will change to gray to indicate that the order is now completely fulfilled.